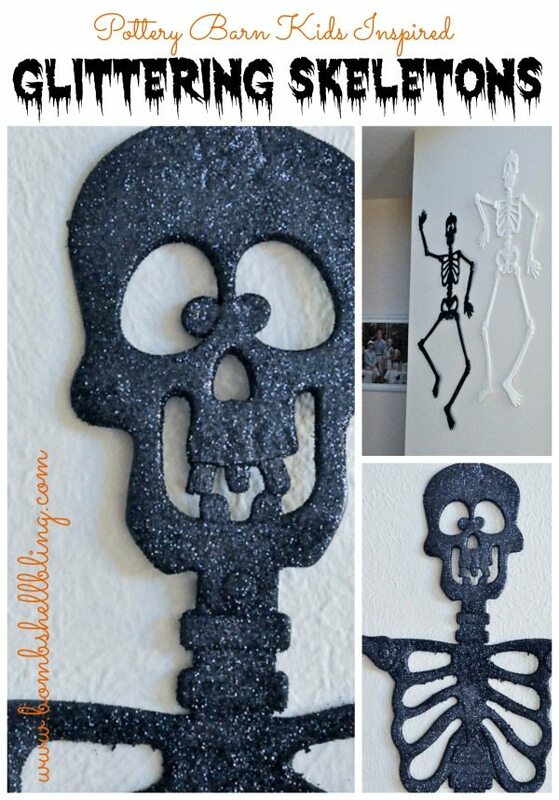 I am so excited to be posting my Pottery Barn Inspired Glittering Skeletons today as part of the Lightning Craft series from Angie at The Country Chic Cottage and Carolina at 30 Minute Crafts. So let’s get going and combine two of my all-time favorite things: glitter and Halloween! Not long ago I walked into Pottery Barn Kids just to browse for fun since I saw in their windows that the Halloween displays were up. 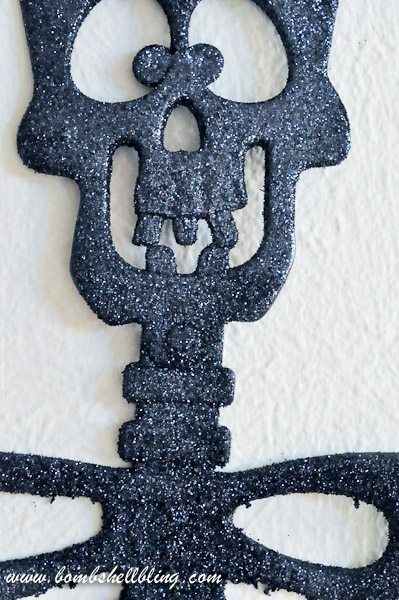 I was stopped in my tracks by a glittering, smiling skeleton. 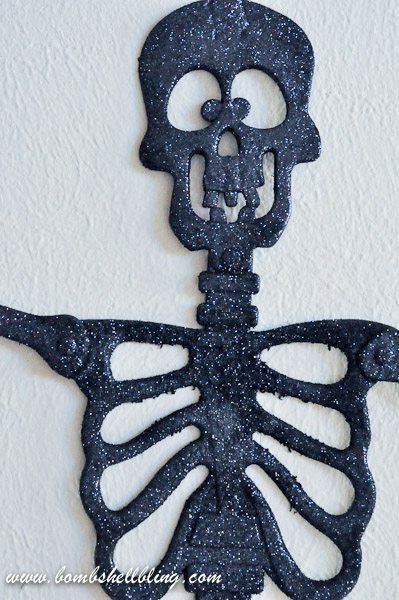 I adore anything that is CUTESY Halloween (not spooky or gory), and I adore glitter! It was a match made in heaven, but then I saw the price tag. 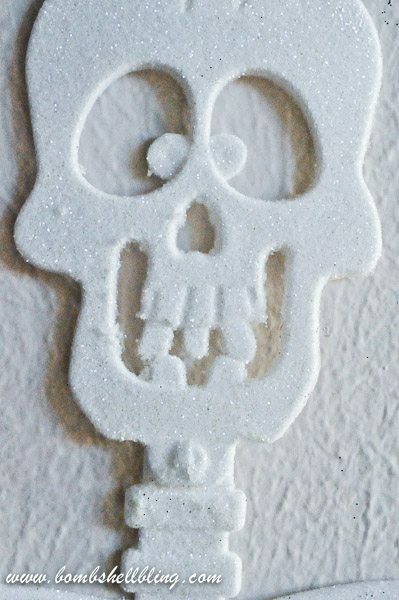 I have splurged on Halloween decor from PBK before (I’m talking to you, astonishingly delightful wall hanging countdown which I NEVER regret having bought! 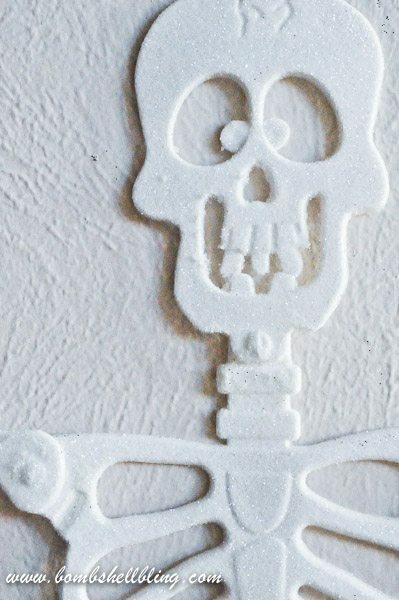 ), but I couldn’t justify this skeleton. I was seriously bummed. Luckily for me I was in Dollar Tree a few days later and spotted some adorable plastic skeletons for a buck! SCORE! So I grabbed a couple of skeletons and headed home to glitter those babies right up. I grabbed some very fine glitter (JoAnn Fabrics has great, affordable glitter, especially if you have a coupon) and spray glue. 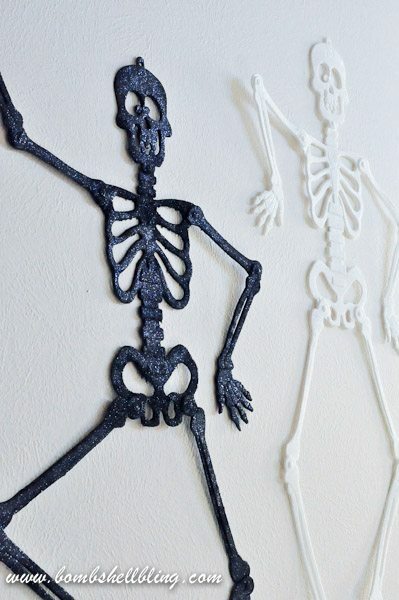 My son and I laid the skeletons on some cardboard and simply sprayed and glittered. I learned from doing my Spooky, Sparkly Spiders last year that you need to be very liberal with both the spray glue and the glitter, so we sprayed only certain body parts at a time. For instance, we sprayed the head well and dumped glitter all over it. Then we moved on to the ribcage, and so on and so forth. It only take a few extra minutes, but it is well worth the effort. We allowed our skeletons to dry overnight, but that was probably unnecessary. Then we shook off the skeletons and tried to salvage as much glitter as possible. I was able to save a TON! 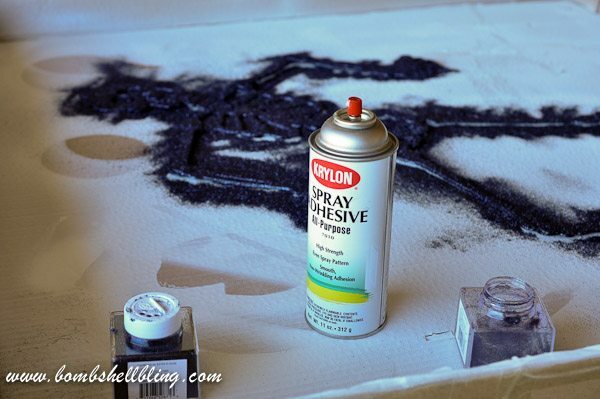 If you carefully preserve your glitter I think that this craft will cost you less than $5! Now hang up those bad boys! (I used 3M strips to hang mine.) Aren’t they fun?! My son had so much fun dancing around trying to act out how he wanted them to be posed on the wall. I love that he loves Halloween as much as I do! Be sure to check out all of the other Spooky Lightning Crafts being shared in this fun series, and come back tomorrow for another lightning-fast Halloween craft from yours truly! EEK! My favorite season is here and I am in full-blown Halloween-obsession mode!! If you liked this tutorial be sure to check out my Spooky, Sparkly Spiders! « $200 World Market Gift Card Giveaway and Some Fab Fall Finds! 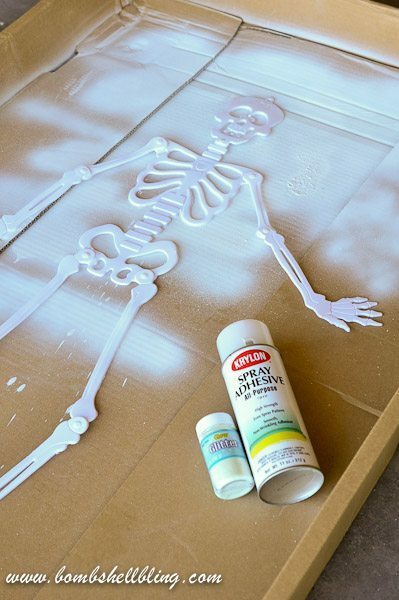 I’m sure your son loved helping out… and dancing around like a skeleton! How fun! I’m so jealous! I wish one of my kids were born in October! I made these tonight! Thanks for the idea!